Our new Cricket Live Scores App for Android is made for the cricket lovers to see the ball by ball live score with user-responsive design, this app can solve the purpose of getting the live score without using much internet connection, and the user can watch all type of international series, domestic cricket series like Test match, ODI and T20. This Android appalso has some other functionality like live matches, recent matches and latest news about the cricket etc. The app is designed with the list of proper categorized classification for the users to access the site without any technical guidelines. In our Cricket Sport APK Application the users can view the live match features in which the users can view the list of live matches scores in all format ball by ball commentary and the user can get the latest news features were they can get the regular updating news with crystal clear details, and then the viewers can also see the list of recent matches with scheduled date. The viewers can also share the app through social networking links by just clicking the share functionality. The match info can be viewed by the users by selecting the particular match which displays theseries name, toss, venue, date, umpires, and third umpire etc. The match summary is also integrated intoour cricket live streaming app.Android appis ready for sale and built with the most pervasive language technologies in the modern world that areJava and XML. The Android Studio Live Cricket Score App is made with deep analyze of our Android app developers experts to make the app more user responsive and high mobile speed insights to make the app run efficiently with the intuitive UI, in addition, our team works on the regular updatingof the app for the users to use the latest features and functionality. 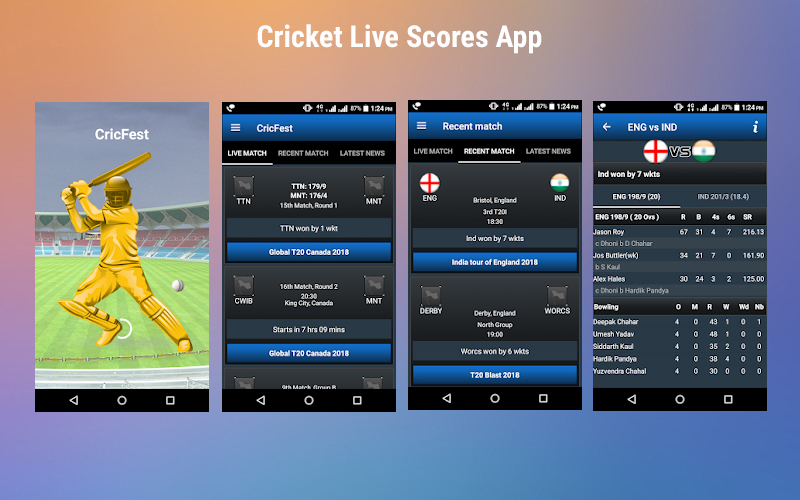 This Cricket Live Scores App will support from the above android version of 4.2 and up. The user can rate the app in the Google play store by just clicking the rate option. The scores can update automatically, the user can also refresh the screen by just pulling the scorecard. This app will surely make you get to entertain and enjoy every match with live streaming scores and news at the palm of your hand with real-time notification. Support team had given value for the customer satisfaction, ready to answer queries and satisfaction plays first priority. Bought Cricket APK with full source code. It been a month I don’t get any bugs. Actually this is the multipurpose application for sports.